In 2015, the world almost got a taste of the “McWhopper,” a combination burger from Burger King and McDonald’s. Here’s the reason it didn’t. Burger King pulled out all the stops in its attempt to make peace with its fast-food competitor. They took out a full-page ad in the New York Times to publish an “open letter” to McDonald’s. “How about we call a ceasefire on these so-called ‘burger wars’?” the letter asked. 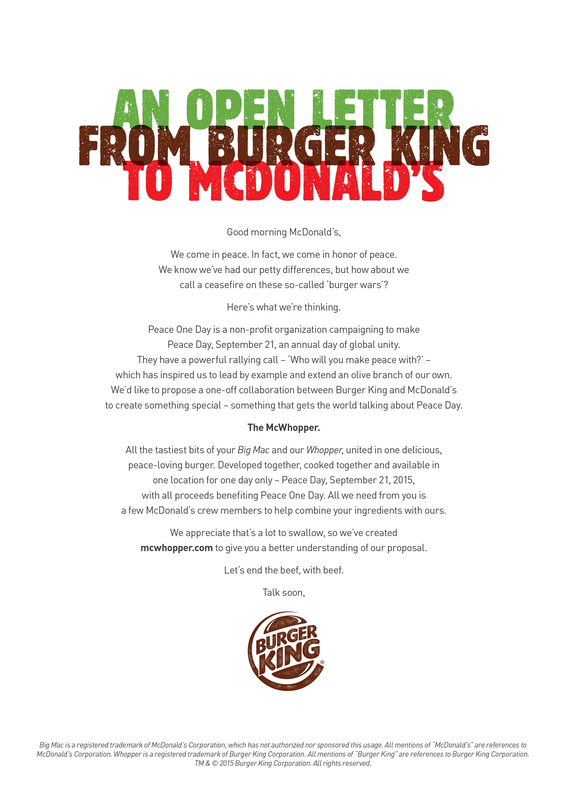 As BK’s letter envisioned it, the franchises’ cooperation, and the resulting burger, would raise awareness of Peace Day. The McWhopper would be available one day only—Peace Day of 2015, September 21—in Atlanta, Georgia. All proceeds from the burger would benefit a nonprofit called Peace One Day, dedicated to promoting peace and education worldwide. A sample McWhopper, a double-patty burger comprising “the tastiest bits” of the Whopper and the Big Mac, even underwent a taste test on the TODAY show. The team-up seemed like a certainty. Find out some more surprising facts you never knew about the Big Mac. The problem? This was the first McDonald’s was hearing about it. Burger King hadn’t consulted anyone from the Golden Arches beforehand. Burger King even acknowledged this on the website it cooked up for the McWhopper: “Our invitation might be unexpected, but it’s 100 percent sincere,” the site said. But that acknowledgment wasn’t enough to appease the folks at McDonald’s for what they viewed as a presumptuous move. So McDonald’s CEO Steve Easterbrook turned down the proposal in a Facebook post. “A simple phone call will do next time,” he signed off. McOuch. Easterbrook’s post also questioned the sensitivity of Burger King’s publicity stunt, saying that “between us, there is simply a friendly business competition and certainly not the unequaled circumstances of the real pain and suffering of war.” And alas, the McWhopper never saw the light of day. Check out these fun facts you never knew about the actual Whopper. So, you be the judge: Was it petty of McDonald’s to say no, or unprofessional of Burger King to promote the burger without consulting McD’s first? Whatever the case, the world never got the McWhopper—but perhaps the two franchises can find it in their hearts to team up sometime in the future. Only time will tell! Next, read about the most shocking fast-food scandals that rocked the industry.